The project comprises a GIS-based historic seascape characterisation (HSC) of the English sector of the Irish Sea. 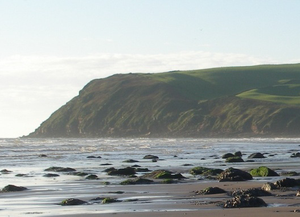 HSC is guided by the same principles as Historic Landscape Characterisation, and is intended to inform coastal and marine management and planning, with particular reference to the role of English Heritage and its statutory responsibilities. The project area stretches from the Anglo-Welsh national boundary in the south to the Anglo-Scottish border in the north. Its landward boundary reaches to at least the Mean High Water Mark as well as inland areas which are perceived to have a maritime character. Seaward, the boundary is marked by the limit of UK Controlled Waters. The national HSC Method was consolidated by the Historic Environment Service at Cornwall County Council in close consultation with English Heritage, bringing together and learning from the experience gained during earlier rounds of the England's Historic Seascapes Programme. Publication of the resulting national HSC Method completed that Programme, producing a robust method for applying the principles of Historic Landscape Characterisation (HLC) to England's coastal and marine zones, extending seaward to the limit of UK Controlled Waters. Some practical recommendations arising from the initial implementation of that Method across the coasts and seas of north east England were incorporated into a revision of the HSC Method Statement in 2010: that revision guided this project. This is one of four projects commissioned towards the end of 2009 to implement England's national HSC Method across a range of areas in English and adjacent waters. Together with the initial implementation project in 2008-9, these projects' outputs form contributions towards an eventual national HSC database for England to be held by English Heritage.